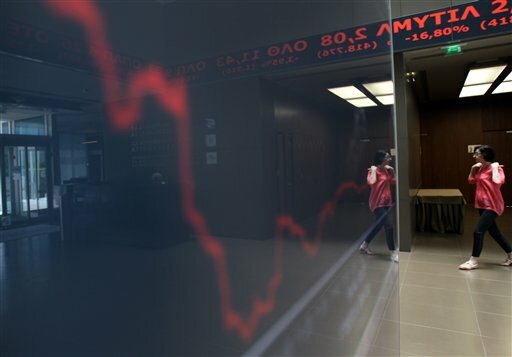 A woman passes in front of chart with the stock prices at the Greek Stock Exchange in Athens, Monday, May 7, 2012. There&apos;s a big debt crisis going on in Greece right now, one that so few people really understand that This American Life even teamed up with Planet Money for a whole episode to explain it. So I wanted to talk today about the Greek debt crisis. When I looked at the news this week – and I don&apos;t look at the news that often, so this is really big – I noticed that the Germans had decided that the best way to deal with the current economic paranoia in Europe was to throw the Greeks out of the European Union. Which many of you probably don&apos;t know, and so I looked it up: In a summary on the New York Times website provided by Peter Poulos, the genesis of the Greek debt crisis was that they sort of binged on debt for the past decade and then in 2009 it all fell apart. And then the EU constructed two giant bailouts, when then created a bunch of internal unrest inside of Greece which then took the government down, so now the people of Greece no longer want to do the bailouts that the EU arranged, and so the Germans decided that the best thing to do was to kick them out. This whole summary of the situation was written, I think, by Peter Poulos. It&apos;s not credited to him, but its sitting next to a picture of him next to a slideshow link where you can see all the cool vintage stuff hes bought in Athens while he&apos;s been stationed there. Now you have to really appreciate – or hate – the irony or lack thereof of the New York Times, to put his sort-of shopping spree link next to his account of a giant economic global disaster. That being said, no one appreciates an amphora more than me so...Opa!